Tampa, Florida is not one of the biggest convention markets by a long shot, but it’s one of the most pleasant. That’s because it looks like the photo above more days than not, with this Sail Pavilion bar right on the bay outside where you just had your meetings. To the left is the Marriott, across the bridge is a Westin on an island, and an Embassy Suites is connected by walkway. Several other chain brands are a short walk away, including the Sheraton right down the pedestrian Riverwalk going along a river for miles. If you stay on that you’ll hit the Armature Works, where there’s a European-style upscale food court and outdoor sitting areas. Sometimes there’s a strange mix of people milling around from one week to the next, like military contractors, then weight loss multi-level marketers, then even the Republican Convention the year Mitt Romney lost to Obama. The largest and most dominant hotel near the convention center is the Tampa Waterside Marriott with a marina out front. It has 719 rooms and is the largest in the area, beloved by business road warrior types who want to rack up their loyalty points without any surprises from one hotel to the next. This is the best bet if you want a big corporate hotel in a terrific location and you’ve got an expense account for those drinks on the deck or by the nice swimming pool that’s a few levels up. Check info and rates at Hotels.com and Priceline. Also nearby and part of the same Marriott brand umbrella now is Westin Tampa Harbour Island, which is a short walk across a bridge from the convention center. 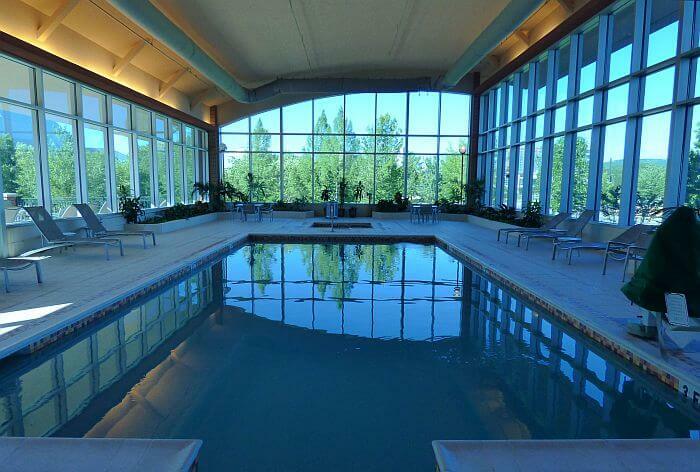 Most rooms have great views of the water and downtown, plus the outdoor pool by the water gives it a nice resort feel. Starwood/Marriott points, “Heavenly beds,” and great bathrooms make guests happy. Plus there are two hopping restaurants and bars also on the water, as well as Starbucks in the building. Check rates later at Priceline or Hotels.com. Embassy Suites Tampa is about as close as you can get to the Tampa Convention center without being on the property. This hotel has its own walkway over to the center, so late-sleeping delegates visiting Tampa for a conference will certainly appreciate the proximity. If you’re anticipating needing a drink after speeches and trade show booth surfing, Embassy Suites has a complimentary happy hour. Book it at Priceline or at Hotels.com. 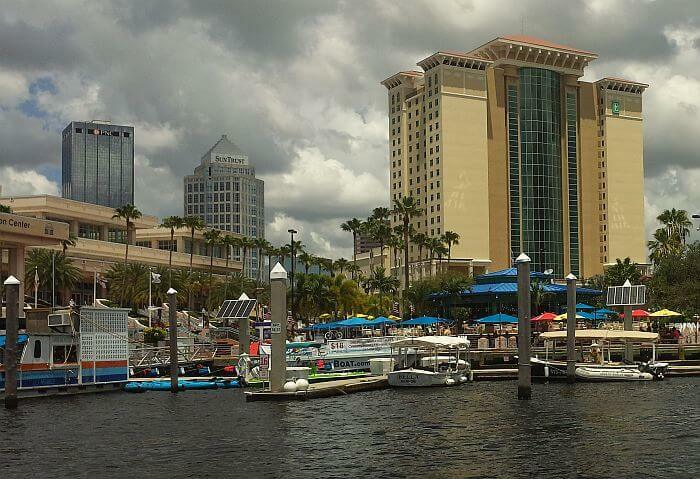 For those who could use a little more exercise, Sheraton Tampa Riverwalk Hotel is less than a ten-minute stroll away. It’s family-friendly and pet-friendly too. 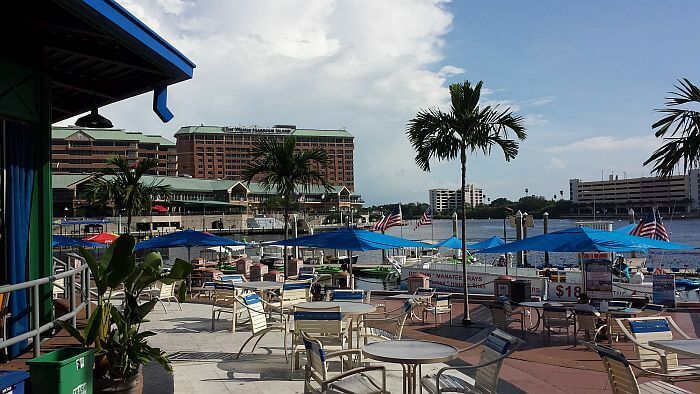 It has a great bar and pool area facing the Hillsborough River, a good brunch on weekends, and is close to events in the park or at the Straz Center. This one is usually priced a bit lower than the others in the area. Check rates online here. The Hilton Tampa is in the same area and both of these are close to the art museum, children’s museum, and a great riverside playground. See rates at the Hilton. 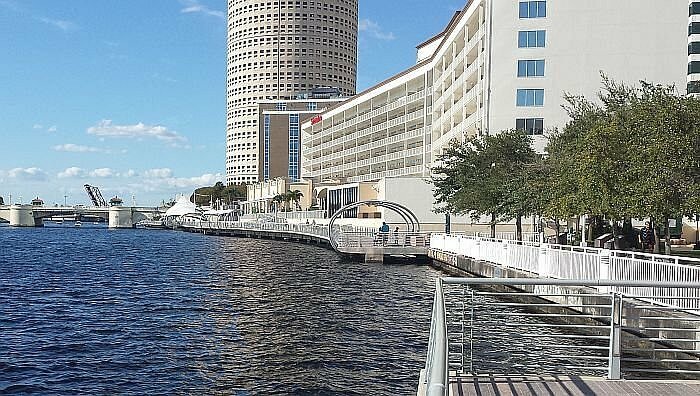 The other major downtown Tampa hotel is about a 15-minute walk from the convention center, so it’s a better bet for those who love to walk than people with mobility issues. 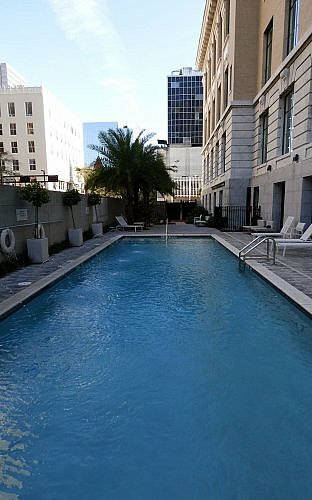 The Le Meridien Tampa has the most character of any of the chain properties, however, housed in a historic former courthouse building. 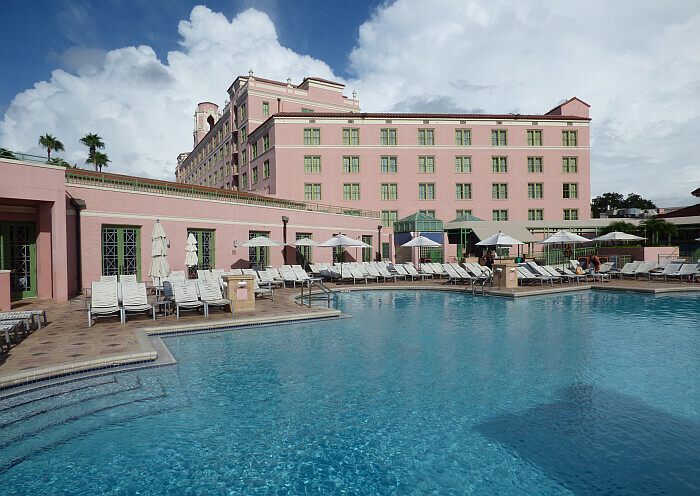 See our detailed Le Meridien Tampa review here, then check prices at Expedia. The “work hard, play hard” crowd may want to take advantage of the cool Tampa Streetcar system and stay in Ybor City instead. This is Tampa’s prime nightlife district, with blocks of bars, dance clubs, restaurants, and a a couple brewpubs—all in a historic zone once occupied by cigar rolling factories employing Cuban immigrants. There’s a Hampton Inn & Suites in Ybor and a Hilton Garden Inn. 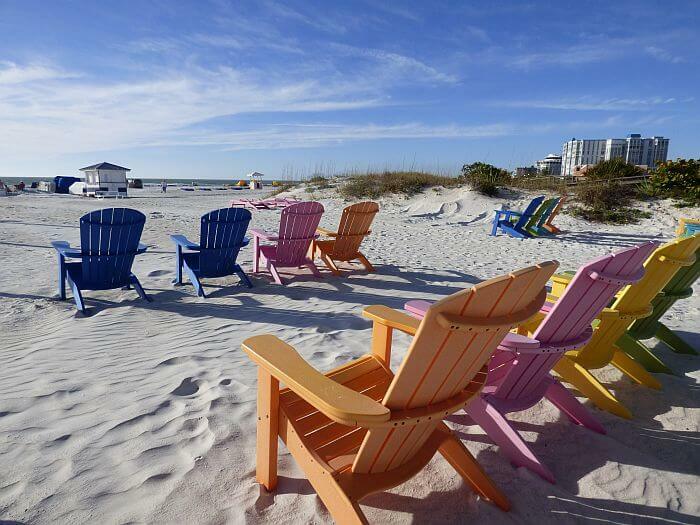 When you’re done with work, spend some more time in Tampa, Clearwater Beach, and St. Petersburg Beach. Book any of these for your next Tampa convention at the links in the text or by searching Tampa Bay hotels at Expedia or HotelsCombined (the latter compares multiple sites at once). Tampa resident Tim Leffel is author of four travel books, including Make Your Travel Dollars Worth a Fortune, and is frequently quoted in the media as a value travel destinations expert. 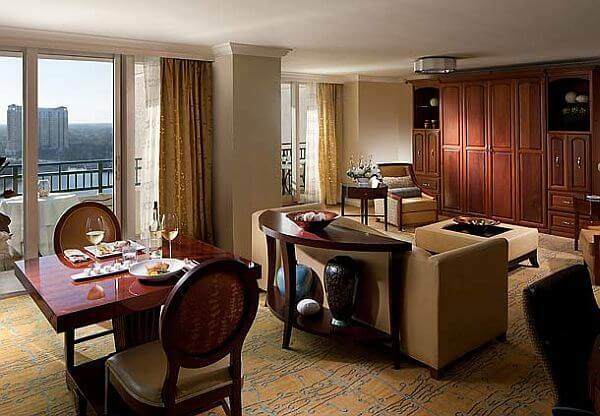 All photos by Leffel except the suite, which is courtesy of Marriott.